Tavanti, Marco & Stachowicz-Stanusch, Agata (Eds). Anti-corruption for Human Security. 2013 Special Number of the International Journal of Sustainable Human Security (IJSHS). Tavanti, Marco and Stachowicz-Stanusch, Agata (Eds). Sustainable Human Security: Corruption Issues and Anti-corruption Solutions. Common Grounds, Sustainability Book Collection, 2014. "Corruption undermines democracy and the rule of law. It leads to violations of human rights. It erodes public trust in government. It can even kill- for example, when corrupt officials allow medicines to be tampered with, or when they accept bribes that enable terrorist acts to take place. (…) It has adverse effects on the delivery of basic social services. It has a particularly harmful impact on the poor. And it is a major obstacle to achieving the Millennium Development Goals"
- U.N. Secretary-General Ban Ki-moon. Corruption, both in its grand and petty typologies, undermines humanitarian assistance, poverty alleviation, human development and human security. In emergencies, post conflict and transitional countries, corruption often takes the form of a systemic and endemic complex phenomenon linked to organized crime and correlated to weak institutions. Numerous studies have demonstrated how corruption contributed to the systemic vulnerability of people already affected by violence, disasters, poverty and inequality. The comprehensive and promising concept of human security needs to be reexamined in light of manifestations of corruption in humanitarian emergencies, peace-building, post-conflict, human rights and corporate participation in development programs among others. During the past decade corruption has ranked highly on the agenda of multinational development agencies, private firms, and policy-makers; it has become one of the most prominent managerial issues at the individual, organizational, national and international level. The recent increase in interest in corruption is related to a couple of factors, the most important being that corruption has become more prevalent in the global economy and that the fight against corruption is central to the struggle for human rights and thus for human security. Corruption is the private gains of individuals and groups with the consequence of undermining social gains and proper democratic, accountable and transparent processes for nation building. For too long the anti-corruption and human security movements have been working in parallel rather than tackling these problems together. The need for exploring the interception of human security with corruption has inspired this special topic of the Journal of Sustainable Human Security on 'Anti-corruption and human security'. This special issue includes contributors that have examined theoretical and empirical aspects of corruption and anti-corruption in relation to human security. The purpose of the Journal and this special issue is to provide practical insights based on analytical reflections of practices as well as practical application of approaches and solutions. 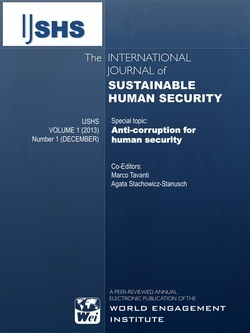 The selected contributions included in the IJSHS 2013 Special Issue on Anti-Corruption offer relevant theoretical and valuable practical insights into the complex relations of sustainable human security at the international level. Authors present Latin American, European, American, Asian, African and Middle Eastern perspectives on corruption issues and anti-corruption solutions. The notion of sustainable human security is illustrated in its historical evolution and relevance to international development, human rights, private companies, good governance, and accountability systems. 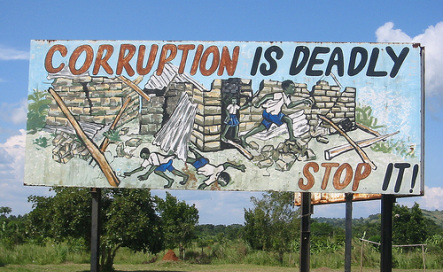 Alfredo Sfeir Younis' "Is Corruption A Threat To Sustainable Human Security? Towards Empowered Citizenship" frames the debate on the crucial relations between sustainable human security and corruption. He argues that the key for such equation lays on the values of citizenship empowerment for democracy and collective awareness. As a well known expert and thinker on sustainable human security, Dr. Sfeir Younis, President of the Zambuling Institute for Human Transformation, offers a 'human' and 'empowerment' centered approach for tackling corruption and lack of citizen's participation. Reflecting his Chilean campaign for "empowered citizenship," he suggests this as a key element in public investment and institutional commitment. Marco Tavanti and Agata Stachowicz-Stanusch's "Sustainable Solutions for Human Security and Anti-Corruption: Integrating Theories and Practices" introduce the special issue and the main concepts. As editors of this special issue, the author illustrates the notions of sustainable human secuirty with its evolution, its pillars and in relation to corruption. They suggest that a "sustainable" adjective to human security is not just about human vulnerability and resilience to natural disasters. It is first and foremost an institutional and systemic dimension for re-centering capacity development approaches into a human-centered integrated framework of analysis and operations. Charles E. Tucker’s Corruption and Human Security: Prepare for the Rainy Day or be Prepared to Drain the Swamp offers a detailed and critical analysis of the impact that development aid has on government corruption. Through numerous examples and well-documented scrutiny on the responsibility to build capacity and causal effect that aid has in perverting a country’s governance system. Flood of money through either natural resources or development aid but without adequate capacity development risk of converting localized petty corruption into institutionalized grand corruption. A type of corruption that is probably impossible to reverse through traditional anti-corruption campaigns. The cases examined of grand corruption institutionalism offer the reason for the suggested systemic (perhaps sustainable) solutions beyond punitive measures and with an ex ante anti-corruption approach based regularization through amnesty programs and other programs for bringing the underground economy into the open. Angela Dettori and Ernestina Giudici’s Sustainability: Towards an anti-corruption strategy to protect human rights in multicultural societies explores the notion of sustainable human security in relation to the workforce environment and the success of businesses. Through a review of organizational central dimensions trust, equality, respect, and multiculturalism, the study offers some solutions on the various initiatives that sustainable enterprises can undertake to combat human insecurity. In this line, the work shows how sustainability reduces corruption by working to prevent human rights violations within the working environment. Claudia Melis and Ernestina Giudici’s Corruption and Human Security: A Further Point to be Added on Multinationals Companies’ Corporate Social Responsibility Agenda? Explore the relation of human security and corruption in connection with Corporate Social Responsibility (CSR). They make an argument on how linking human security and corruption through the lens of CSR improve our understanding about the possibilities for mitigating corruption. The examples and solutions provided are relevant to multinational companies practicing CSR and actively engaged in reducing corruption activities. Paolo Canonico, Stefano Consiglio, Ernesto De Nito, and Gianluigi Mangia’s "Garbage is Gold": The Emerging Threat for Human Security explores the consequences of corruption on human security, specifically on the health conditions and the quality of life. Through an analysis of managerial corruption and the notion of human security, they present a case study related to the illegal traffic of toxic waste from Northern Italy to the Campania region. The study is based on qualitative research and official judiciary sources. Jae Eon Yu’s "The holistic educational approach for anti-corruption in human security: The case of Korean Business Education, proposes a systems approach through a holistic business education centered on inclusiveness and co-operative human security. The study argues that unethical practices, including corruption practices, are best addressed through business education centered on ethical programs, participatory processes, and action learning aimed at increasing ethical sensitivity for human security. A systems approach is necessary for business ethics education as demonstrated in the cases of educational practices in Korean universities. Kemi Ogunyemi’s Human Security and Development: Anti-corruption Solutions examines how human security is understood and how anti-corruption efforts could enhance it. Through short narratives of the human experience in Nigeria, the study explores the relationship between corruption and human security in the context of a developing country. Human security is considered in the context of human rights and development ethics. Local engagement and the consideration of narratives of people in specific situations constitute an invaluable resource for understanding and resolving the challenges of corruption and human security. Dima Jamali, Alessandro Lanteri, and Amy Walburn’s Corruption and Economic Security in the Arab Countries: The Role of Business Schools provides a study of accountability and corruption and its positive or negative repercussions on human security in Arab societies. They suggest that business schools can actively fight corruption and promote economic security by showing how corruption practices promote inefficient economic transactions and undermines economic security. They provide a convincing argument and practical solutions for business schools and what they can do to enhance human and economic security by reducing the occurrence and dependence on corruption in Arab states.